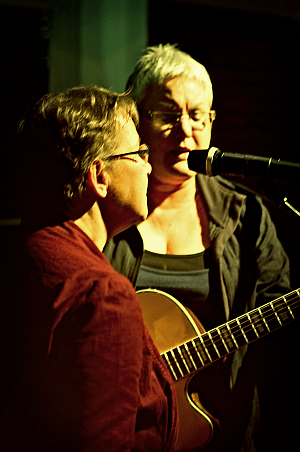 Two Doors Down is a collaboration between singer-songwriter Irene Bom and her friend, Margriet van Overbeeke. Initially Margriet sang and played recorder and percussion, but she now also plays melodica, glockenspiel and ukelele. Mixing and matching instrumentation, they can give each song its own character. ‘On repeat (Missing you)’, really lends itself to the melodica, with its muddy overtones. ‘Boy’ (a wedding song from the perspective of the ‘best man’) is ‘dressed up’ using claves. What strikes people most about Two Doors Down are the harmonies and the wide range of themes. For example, there’s a song about Dolly the Sheep (‘Sorry Dolly, you are not unique’) and one about nomadic communities (‘Poor world’). The songs are not only fun and interesting to listen to. They might even get you thinking. Check out their EP, “Life’s like that”. Margriet van Overbeeke – vocals, recorder, glockenspiel, melodica, ukulele, percussion.